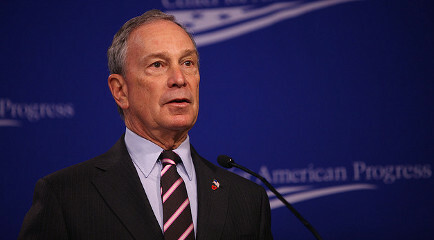 New York City Mayor Michael Bloomberg was in China last week where he assumed leadership of the C40 Climate Leadership group, a coalition of cities formed in 2005 aimed at reducing carbon emissions..
Bloomberg praised Chinese participation in the summit, saying he’s encouraged that some mayors in China have become interested in environmental issues. "For the first time, there is an understanding in China that the environment is something that they cannot walk away from, they can't treat as a second-class citizen any more. When you're starting to get your rivers polluted and your air unfit to breathe, you've got to do something about it," Bloomberg said. In an effort to make their cities greener, several Chinese mayors are promoting the use of solar power, scaling back the number of polluting factories as well as building new subway lines and adding more electric-powered vehicles on the road. At a speech at the conference, Bloomberg vowed to promote the use of electric taxis, and encourage other mayors to follow suit, to help curb emissions and ease air pollution in cities. "Think of that — a million-plus autos, the most iconic vehicles in our downtowns, that we can start to work together to make more efficient and less polluting," Bloomberg said. The Bloomberg administration began a pilot program last summer to install recharging stations in the city for electric vehicles. New York’s other green initiatives are planting more trees and reducing building pollution, the mayor said. Bloomberg’s own personal green initiative includes taking the subway to work everyday, where he is a familiar site to many straphangers.